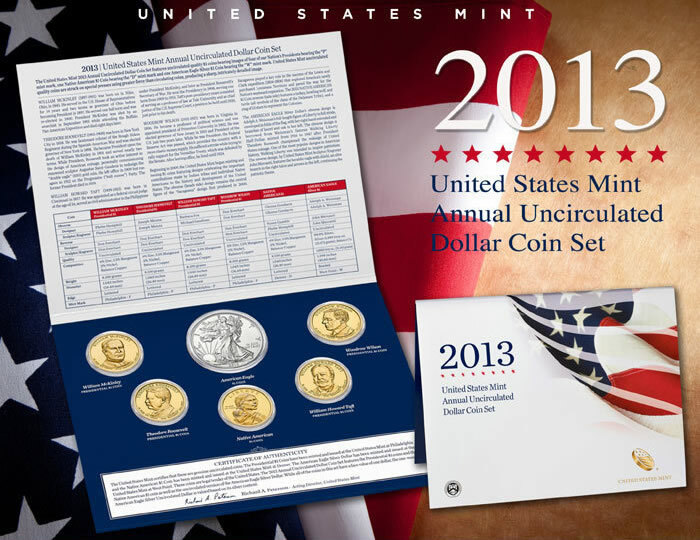 On Thursday, Nov. 14, the United States Mint released its 2013 Annual Uncirculated Dollar Coin Set. Sales began at 12:00 noon ET and opened at $44.95, which is $10 less than the cost of last year’s set when it debuted. 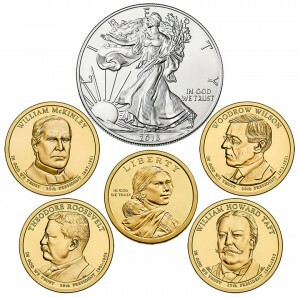 These six dollars are mounted within a durable folder that offers descriptions of each coin enclosed. A Certificate of Authenticity is displayed below the coins. Orders for 2013 Annual Uncirculated Dollar Coin Sets may be placed straight from the U.S. Mint, online here, or by calling 1-800-USA-MINT (872-6468). There are no mintage limits or household ordering limits. As a reference that may or may not mean anything, last year’s set went on sale Sept. 6, 2012 and it sold out on May 3, 2013 with ending sales of 28,368. 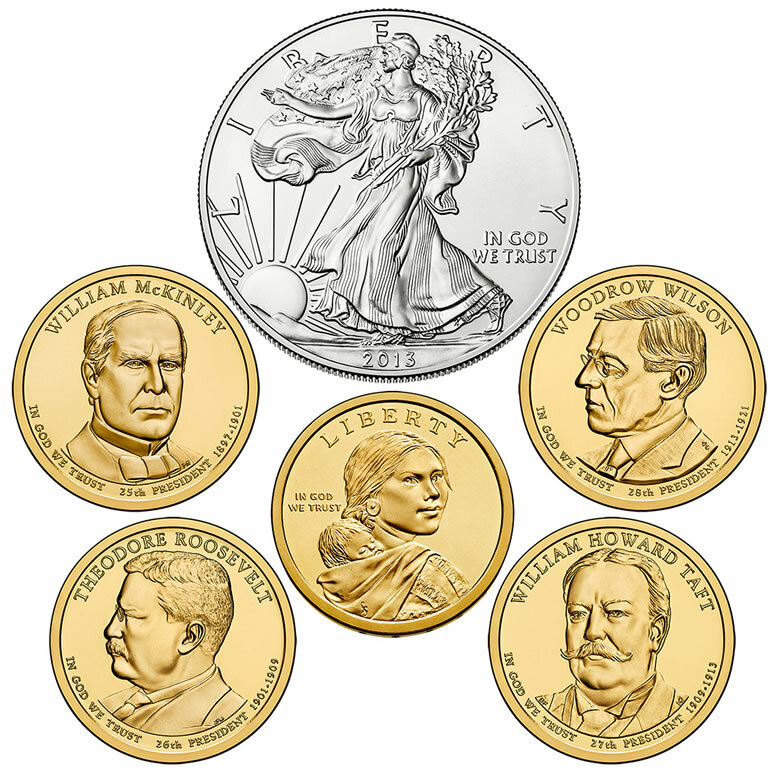 Reverses (tails side) of 2013 Presidential $1 Coins offer portraits of Presidents William McKinley, Theodore Roosevelt, William Howard Taft, and Woodrow Wilson. A rendition of the Statue of Liberty is common to the obverses (heads side). Shown on reverses of 2013 Native American $1 Coins is turkey, howling wolf and turtle. These are clan symbols of the Delaware Tribe. Reverse designs change annually for these coins, with this year’s dollar commemorating The Delaware Treaty (1778). A portrait of Sacagawea and her baby appears on obverses. Finally, designs on the American Silver Eagle have been constant since the series kicked off in 1986. Obverses have Weinman’s "Walking Liberty" design and reverses showcase a heraldic eagle with shield. I just got one of the 2013 United States Annual Uncirculated Dollar Coin Set (XA5) directly from the U.S. Mint but the one I got has an American Silver Eagle without the “W” mint mark. Is this an error or did the U.S. Mint sale some of these sets without the burnish Eagle or are they burnish Eagles without the “W” mint mark or is the Silver Eagle not even a burnish Eagle? Hope someone can help me with this.